Firstly, I want to clarify that I am speaking from the perspective of Universal integrity which is the visceral and energetic alignment within yourself and the Universe as a whole. 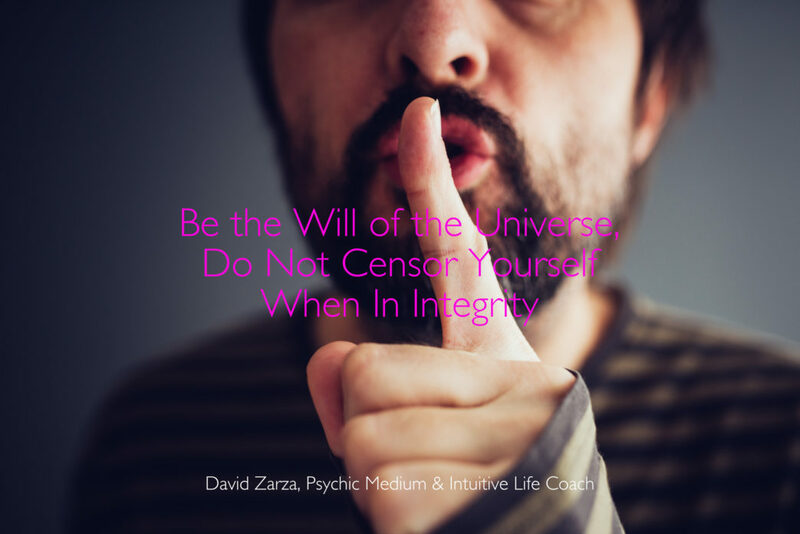 While in Integrity, you must never censor yourself because it is the Universe wishing to communicate a message through you! So what does this mean? The Universe is all of creation including the Divine within the entirety of the Universe, it has been my guide for many many decades, if not all of my life. The Universe is conscious and all conscious beings are the Universe in disguise. As such, when in Integrity, whenever you communicate, you must know that you are the embodiment of the Universe communicating whatever it is you’re sharing about – it can be a compliment, a slight, an honest statement, a judgment, a truth, a scream, a whisper or a lesson or something else. Essentially, when making the being in integrity as a way of life, you are becoming an Agent of the Universe. As an Agent of the Universe (AU), you must be aware of the thoughts you have, the emotions behind your thoughts and actions, the words you use and every action you take in life because the Universe is working through you at all times. This might seem overwhelming but it is the easiest things to do and the most peaceful way to be when you are the prism through which the light of the Universe shines. Speak your truth because you do not know if the target of your words needs to hear what you are about to say. Also know that the ideas like, “I don’t want to hurt them by saying this,” or “why should I be the one to mention this,” or “don’t they know this already?,” are only fears coming from your human self. Trust, while in Integrity, that the Universe knows the why.